Discover the grandeur of majestic mountains and verdant landscapes, a nature lover's paradise right in your own backyard. At Shanty Creek Resorts, surrender yourself to the tranquil splendor of awe-inspiring vistas in Northern MI. After an exhilarating day of playing their championship golf courses, relax in your comfortable suite or unwind in one of their sparkling pools. Their extensive family programs allow parents and children to design a personalized vacation that is sure to please every member. This Northern Michigan golf resort offers state-of-the-art meeting facilities coupled with inspiring views from every window, creating an environment conducive to maximum productivity, the perfect venue to mix business and pleasure. On your Michigan golf vacation; delight in a world of wondrous adventure at this Bellaire, Michigan resort. From a few rounds on their award-winning golf courses to hiking or biking the countryside, Shanty Creek Resorts provides a magical setting for your Northern Michigan getaway. 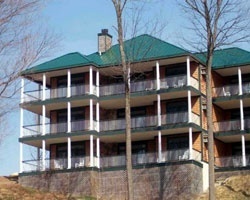 Extensive amenities, services and exciting programs make Shanty Creek Resorts the best place to vacation in Michigan. Enjoy summer vacations with the whole family at this lovely mountain getaway! Lots of exciting activities available! Make an offer today!